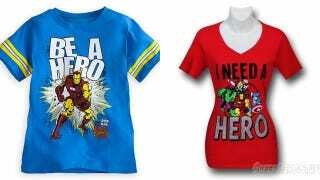 One of these Marvel Avengers shirts is a boys shirt, and one is a girls shirt. TRY TO GUESS WHICH IS WHICH. Really, Marvel? Really? Even if you ignore the insane sexism posed by releasing these two t-shirts simultaneously — like, even if you are genuinely, unrepentantly sexist in real life, which I don't believe is the case — is there seriously no one in your licensing department that is cognizant enough to realize that maybe, just maybe, releasing products like this might get you just a bit of negative attention? Thanks to my pal Taylor E. for the tip.